Today we are going to look at the new player on our market - Memory Solution, and try to find out what should we expect from the flash cards marked "takeMS". The test technique has changed a bit: the CompactFlash cards, like before, are tested on the 6 in 1 IEEE1394 card reader, while the MMC and SD are tested with the x-Drive 7 in 1 which was recently benchmarked and proved to have very good performance regarding these standards. The testbed configuration and test software remain the same. 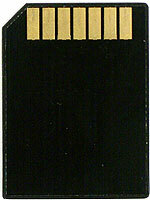 We have received the 1GB card as such cards is getting more popular these days. Although the price for memory keeps on rising a little bit, which can affect the demand of capacious cards, they will anyway grab some marketshare because they are a good match for today's cameras as matrices keep on growing up, and even value models are already outfitted with 3 or 4 Mp models. The scores are average in all parameters. 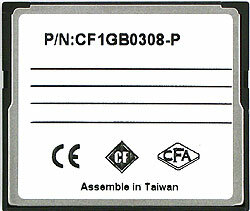 They are closest to the PQI Hi-Speed, - that is why these cards might have something in common. The modern SLC models are certainly unreachable, but our heroes have a pretty moderate price, which is more important for many out there. That is why they can be an optimal choice of those who mostly use JPEG or need much flash memory at a moderate price for equipment different from digital cameras. 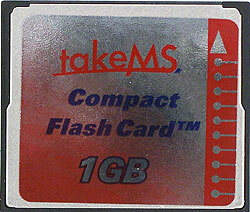 Thanks to Nokia who keeps to the MMC format, as well as to flash card makers who raised the MMC size to the level of 512 MB, this standard didn't faded out - there are some niches where it copes well with its functions. But the large-sized cards face another problem - the problem of speed, but it can be alleviated (like in case of Kingmax's cards). 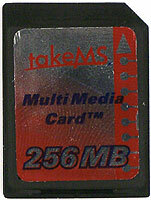 What are the takeMS 256 and 512 MB cards going to show us? 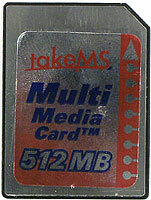 The access time of the 512 MB card is higher than average (but it's not fatal), but the smaller-size card performs not that bad. The speed indicates that the specs weren't extended. The speed of the MMC's follower is not limited that much, and the cards can show four times better scores without deviating from the standard. They are also as compact as the MMC, their functionality is potentially better, and the prices are comparable- no wonder that SD is widely supported, even in value solutions. 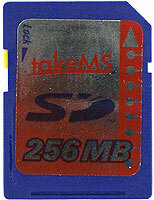 That is why it's very interesting how the cards of the same size (256 and 512 MB) are going to perform. The average access time is ordinary. Here's the potential of the device that supports all SD specs:) The 256MB card works slower than the bigger-size siblings, but even this card outperforms the most CompactFlash cards (only except the Transcend 45x). 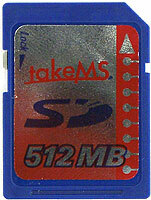 The 512 MB cards run even faster. 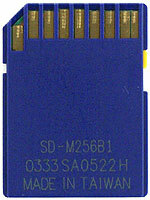 Simple Technology modified the controller used for the 512 MB cards, but it didn't get better. However, it's still enough to stand against most 256 MB models and even many 512 MB ones, especially if the cards are not that fast, like the takeMS 256 :) And its sister - the 512MB solution is a pure hurricane! I've never got such results from other cards of different types. The scores are much closer to flash drives. The CF and MMC cards demonstrate average results. The SD 256 looks disappointing - I wish it had a higher write speed, at least, 1.5 times higher as there are a lot of cards of the same size and speed. But I liked the 512MB model very much - it's the best demonstration of what the SecureDigital format is able of provided that the developers do not save on controllers and flash memory.